You’ve bent all the rules with sewing, so now what? It’s high time you made your own fashions even more you with Amy Karol’s next craft revolution: Bend the Rules with Fabric. You’ll learn everything you need to know to turn a plain piece of fabric or a garment into the perfect showcase for your personality. In this follow-up to the wildly popular Bend-the-Rules Sewing you will see how easy it is to alter fabric, making and using your own custom stamps; make stencils that will totally transform totes and tees; rescue tired clothes with a new dye job; and use appliqués to spruce up anything that needs a little TLC. With Amy’s familiar, friendly tone and valuable advice, you’ll see every piece of fabric as blank canvas for your artistic vision! 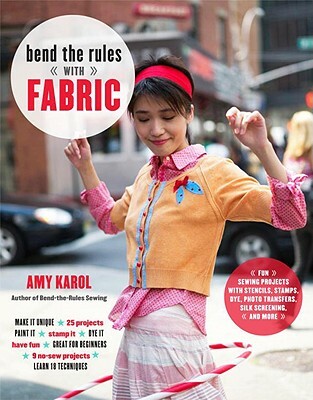 AMY KAROL is an artist, author, and self-professed fabric junkie. Her writing and projects have been featured in "Country Living," "Sew Simple," "Publisher's Weekly, "and "BUST "magazine, and her designs and creations have been displayed in galleries in Japan and throughout the United States. Follow her crafty adventures on her popular blog, Angry Chicken, found on her website www.amykarol.com.